Zebra Juice Dessertz range consist of 3 amazing flavours, Blue Dream Ice Cream, Strawberry Banana Waffle, and Toasted Marshmallow. These flavours are available in 50ml 0r 100ml shortfill bottles. Zebra Juice Fruitz range consist of 3 amazing flavours, Mango Blackcurrant, Pineapple Mango, and Twisted Lemon. These flavours are available in 50ml 0r 100ml shortfill bottles. 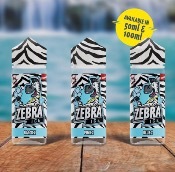 Zebra Juice Ice range consist of 3 amazing flavours, Black Z, Pink Z, and Blue Z. These flavours are available in 50ml 0r 100ml shortfill bottles. Zebra Juice Refreshmentz range consist of 3 amazing flavours, Super Soda, Grape Juice, and Cola. These flavours are available in 50ml 0r 100ml shortfill bottles. Zebra Juice Scientist range consist of 3 amazing flavours, Project-Z, Watermelon Coconut, and Zeb-Tastic. These flavours are available in 50ml 0r 100ml shortfill bottles. Zebra Juice Sweetz range consist of 3 amazing flavours, Drumstick. Rainbow Stripes, and Zubba Bubba. These flavours are available in 50ml 0r 100ml shortfill bottles. 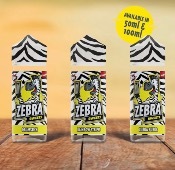 Zebra Juice Zillionz range consist of 3 amazing flavours, Blackcurrant, Bubblegum, and Apple. These flavours are available in 50ml 0r 100ml shortfill bottles.